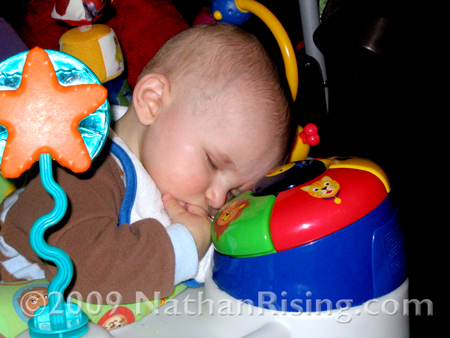 The other day, I put Nathan in his exersaucer to play. I could hear him banging away at the toys on the tray and talking to the different pieces. After a few minutes, however, all noises coming from his bedroom ceased. 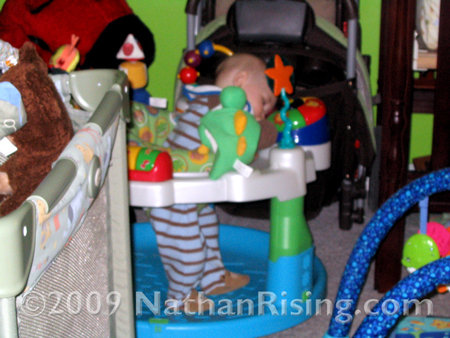 I peeked in to see what he had gotten into when I saw that he had fallen asleep while standing up in his exersaucer! He took a quick, 10 minute catnap. When he woke up, he was refreshed and giddy with Good Mood. Good Mood is a great thing for a baby to have, believe me. He seriously loves that exersaucer. I think he would totally live inside it if he could. 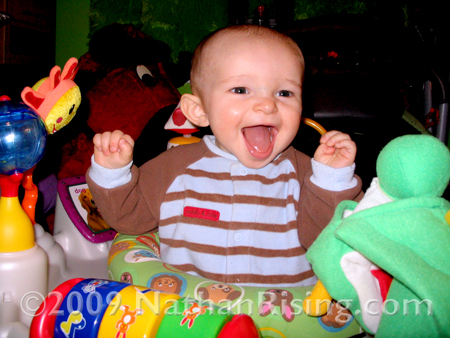 And I’m happy with that because he’s learning all kinds of things… shapes, sounds, textures, etc. And a happy baby means a happy house.